| Sit back and listen with a piece of ginger cheesecake. I received a message from someone looking for an English translation of Zahvalnost by Hor Kewser. It had been awhile since I’d translated anything, and it was nice to get back into it! See the video here and here. In the silence I whisper Your praises. Have you registered with Seekers Guidance yet? This course will introduce students to the four gospels found in the New Testament (Matthew, Mark, Luke, and John) and provide them with new insights and a more nuanced understanding of who Jesus (peace be upon him) was for the objective of calling others to the truth of Islam. This course is offered in HD video format, taught by Ustadh Ali Ataie. There’s lots of stuff I need to do to the blog. I also want to add more links but am having trouble with the widgets and all. As for us, we are fine here. Mini-Chef is 13 months now, and I’ve recently finished a couple articles. It’s a collection of talks by Cambridge professor Tim Winter, a.k.a. Shaykh Abdul-Hakim Murad. There are A LOT of nice talks on there, but for now I’ll just link two that answer a few frequently-asked questions about the similarities and differences between Christianity and Islam. The talks are free to download. Sorry for the long hiatus; I’ve been planning to post for awhile now, but haven’t gotten around to it. 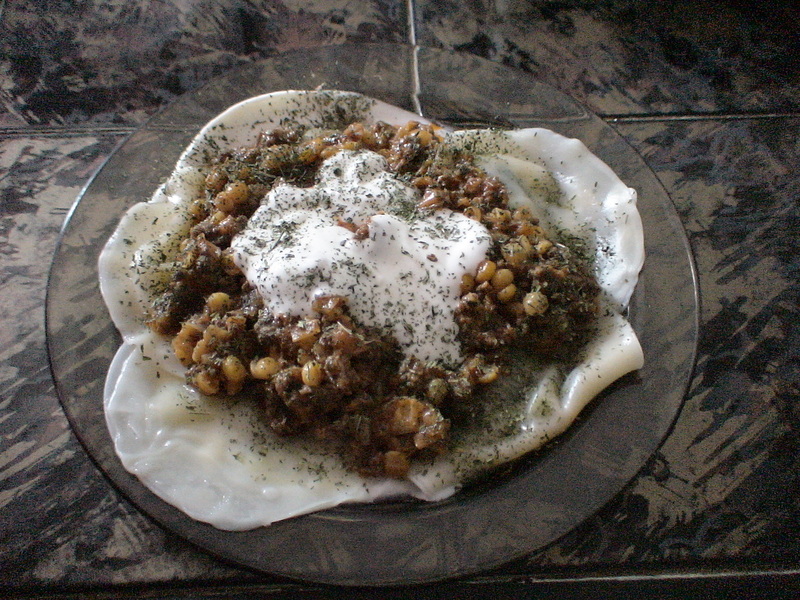 Anyways, here’s a nice Tajik recipe, because that’s all I have time to post for now. Keep in mind I don’t measure anything, so any measurements are approximate. You could probably also make this vegetarian with crumbled tofu or extra split peas. 60-70 round or square dumpling wrappers (I used dim sum wrappers) – you can make your own if you REALLY want to. Chop the leek, and wash and drain in a colander, pressing out as much water as possible. Place the leeks in a mixing bowl, and add salt and red pepper, mixing well. Mix in the 1 tsp oil. Heat 3 tbsp vegetable oil in a pan and fry the onions, stirring occasionally, until they are golden brown. Add the meat and fry until browned. Drain the split peas and add them too, along with the tomato sauce and some hot water, just enough to cover the meat and beans. Bring to a boil and add salt and pepper to taste (don’t add too much salt as the sauce will thin out later and be more concentrated), lower the heat, cover, and simmer about half an hour, or until the peas are cooked. Remove the cover and allow to simmer until the sauce boils down to desired thickness, and adjust the seasonings. While the meat sauce is cooking, stuff the dumplings: lay out a few wrappers and place 1-1½ tsp of the leek mixture in the centers of each. With your finger, run some water along the edges of each wrapper and seal with a second wrapper, pressing edges together firmly. Set the dumplings aside as you finish them (try to work quickly so they don’t dry out). Bring a big pot of water to boil, add 1 tsp salt and a bit of vinegar, and boil the dumplings for 7-10 minutes. You may have to boil them in two batches. Gently push them back under the water with a spoon when they come up. Mix the yogurt, garlic, and salt. Swirl a bit of the yogurt mixture over the serving plate, or on individual plates. When the dumplings are done, remove them gently with a slotted spoon and try to let as much water run off as you can. Place on the serving plate, over the yogurt. Top with the meat sauce and more yogurt, and sprinkle liberally with the dried mint. Noosh-e jan! This is the brand new video by the always-wonderful Ansambl Dah Ljubavi! The text and translation are below the video. They are one of the best young performing groups in Bosnia, and I’m looking forward to seeing what they do in upcoming years! Do you hear the voice from my heart that calls you? Today is the 16th anniversary of the Srebrenica massacre. Here you can see a march to commemorate the victims and their families. There are many things on my mind about the beautiful country and people who remain, and have flourished and blossomed even after these relatively recent tragedies, but I don’t know how to express them. Here are the Bosnian and English versions of Burhan Šaban’s new song for Srebrenica; as always, it’s much better in the original language! Today is Muslim World Music Day! I wanted to do more for this. Things have been busy here, but really I have no excuse. Anyways, try to participate in some way, at least by checking out their site linked above. Here are some great videos to get you started! Debu is a group of mostly Americans living in Indonesia (more about them a couple posts down). In this video, they are singing in Turkish. For some of the lyrics and translation, open this video in youtube and see the comments section. Abida Parveen lives in Pakistan, and is a legendary singer of Kafi and ghazal. Sorry it’s not too clear; they will be in Prague again next month. Rejjan is a young choir from Sarajevo.